An overview of the Prankids cards from Hidden Summoners. “Prankids” Special Feature: Fusion & Link!! Another Tumultuous Day At The Prankids House!! The new series “Prankids” debuts in “Deck Build Pack Hidden Summoners” (on sale August 4th, 2018)! It’s a series that specializes in bringing out their allies from the Deck or GY, to let you Fusion or Link Summon! The ace monsters of this theme are incredibly powerful with super flashy effects, as the Fusion Monster destroys all monsters your opponent controls, while the Link Monster wipes out all Spell & Trap Cards! Many of these monsters can effect their effects even during your opponent’s turn, allowing you to make the Duel one heck of a headache for them!! Let’s check out their features here! These Fusion Summons which can use monsters from the hand as material can also serve for bringing out cards early on. By using the effects of Fusion Material monsters (described later) and the effects of your Fusion Monsters, you can aim for big developments by calling a ton of friends!! Its Effect That Wipes Out Your Opponent’s Monsters Can Be Activated Even During The Opponent’s Turn! If Your Opponent Takes It Out, You Can Call An Ally From The GY!! Must be Fusion Summoned. (Quick Effect): You can Tribute this card; destroy all monsters your opponent controls. If this card in your possession is sent to your GY by your opponent’s card: You can target 1 monster in your GY, except a Fusion Monster; Special Summon it. You can only use this effect of “Prankids House Battle Butler” once per turn. By Tributing Itself It Can Call 2 Friends From The GY, Including Link Monsters! It Also Has An Effect To Attack Directly!! If this card is Fusion Summoned: You can have this card lose exactly 1000 ATK for the rest of this turn, and if you do, it can attack directly this turn. You can Tribute this card, then target 2 “Prankids” monsters in your GY with different names, except Fusion Monsters; Special Summon them, but they cannot attack this turn. You can only use each effect of “Prankids Rocket” once per turn. Your Opponent Cannot Activate Effects When Your Buddies Attack!! Its Effect That Swaps Out Two For 2 Allies From The GY During The Opponent’s Turn Is Also Strong! If your “Prankids” monster attacks, your opponent cannot activate cards or effects until the end of the Damage Step. During your opponent’s turn (Quick Effect): You can Tribute this card, then target 2 “Prankids” monsters in your GY with different names, except Fusion Monsters; Special Summon them, and they cannot be destroyed by battle this turn. You can only use this effect of “Prankids Weather” once per turn. 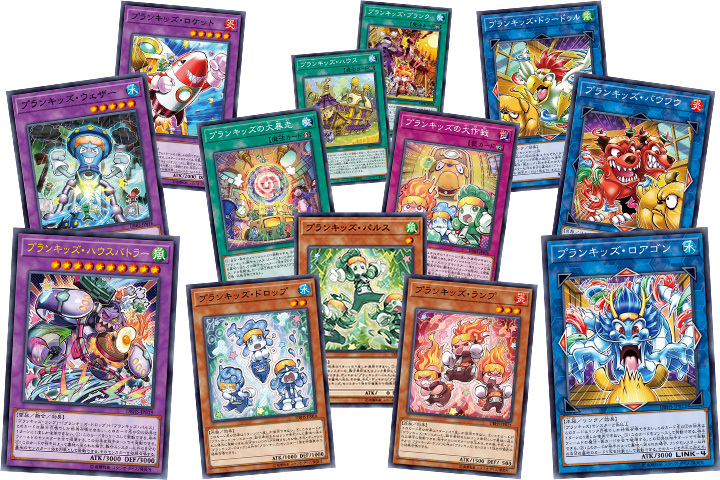 They have effects to Special Summon “Prankids” monsters from the GY (though you can’t pick Fusion Monsters), meaning you can bring out Link Monsters! And by Link Summoning further, you can use the Link Monsters’ effects to deploy and assemble further cards for further Fusion Summons! Link Summons by bringing friends to the field!! While using effects to add cards to your hand that help bring out further cards, you can also support developments by using the Link Arrows for Fusion Monsters! An Effect That Activates Even On The Opponent’s Turn That Can Wipe Out The Opponent’s Spell & Trap Cards!! If It’s Taken Out By The Opponent You Can Add Cards From The GY To The Hand! Must be Link Summoned. (Quick Effect): You can Tribute this card; destroy all Spells/Traps your opponent controls. If this card in your possession is sent to your GY by your opponent’s card: You can target 1 card in your GY, except a Link Monster; add it to your hand. You can only use this effect of “Prankids Roargon” once per turn. It Has Two Effects To Add “Prankids” To The Hand: One To Add A Spell/Trap Card From The Deck, The Other Is 2 Cards From The GY! If this card is Link Summoned: You can add 1 “Prankids” Spell/Trap from your Deck to your hand. You can Tribute this card, then target 2 “Prankids” cards in your GY with different names, except Link Monsters; add them to your hand. You can only use each effect of “Prankids Doodle” once per turn. It Strengthens Friends It Points To!! During Your Opponent’s Turn, It Can Add Related Cards From The GY To The Hand, As Well As Protect Two Allies From Being Destroyed By Effects! “Prankids” monsters this card points to gain 1000 ATK. During your opponent’s turn (Quick Effect): You can Tribute this card, then target 2 “Prankids” cards in your GY with different names, except Link Monsters; add them to your hand, also “Prankids” monsters you control cannot be destroyed by your opponent’s card effects this turn. You can only use this effect of “Prankids Bowwow” once per turn. They have effects to add “Prankids” cards from the GY to the hand, allowing you to add the cards you need for the vital next step back to your hand! Besides recovering monsters of he series, you can also choose Spell/Trap Cards, allowing you to use this effect to set up for further Fusion Summons!! “Prankids” Monsters That Support Deployment!! They can call allies from the Deck if used as material for a Link or Fusion Summoned, allowing to aim for further Link and Fusion Summons!! It Has An Effect To Send 1 “Prankids” Card From The Deck To The GY, And Then Call An Ally From The Hand Or Deck! If this card is sent to the GY as Fusion or Link Material for the Summon of a “Prankids” monster: You can send 1 “Prankids” card from your Deck to the GY, except “Prankids Pulse”, then you can Special Summon 1 “Prankids” monster from your hand or Deck in Defense Position, except “Prankids Pulse”. You can only use this effect of “Prankids Pulse” once per turn. It Supports Developments By Recovering 1000 LP And Call An Ally From The Hand Or Deck! If this card is sent to the GY as Fusion or Link Material for the Summon of a “Prankids” monster: You can gain 1000 LP, then you can Special Summon 1 “Prankids” monster from your hand or Deck in Defense Position, except “Prankids Drop”. You can only use this effect of “Prankids Drop” once per turn. It Inflicts 500 Damage To The Opponent And Calls An Ally From The Hand Or Deck! If this card is sent to the GY as Fusion or Link Material for the Summon of a “Prankids” monster: You can inflict 500 damage to your opponent, then you can Special Summon 1 “Prankids” monster from your hand or Deck in Defense Position, except “Prankids Ramp”. You can only use this effect of “Prankids Ramp” once per turn. “Prankids” Spell & Traps That Support The Series Are Also Included! “Prankids” Spells and Traps that support deploying cards and strengthening allies are included! By using the effect of “Prankids” Link Monsters, you can easily add them to your hand! It Adds An Ally From The Deck To The Hand And Strengthens Allies And Weakens Enemies Based On Fusion Summons And Link Summons! When this card is activated: You can add 1 “Prankids” monster from your Deck to your hand. Once per turn, if you Fusion Summon a “Prankids” Fusion Monster: You can have all monsters you currently control gain 500 ATK (even if this card leaves the field). Once per turn, if you Link Summon a “Prankids” Link Monster: You can have all monsters your opponent currently controls lose 500 ATK (even if this card leaves the field). You can only activate 1 “Prankids House” per turn. A Continuous Spell That Supports Fusion & Link Summons By Calling Tokens! Its Effect Returns Cards In The GY To Draw!! You can discard 1 “Prankids” card; Special Summon 1 “Prankids Token” (Pyro/FIRE/Level 1/ATK 0/DEF 0), which cannot be Tributed. During your End Phase: You can target 3 “Prankids” cards in your GY, except “Prankids Prank”; shuffle all 3 into the Deck, then draw 1 card. You can only use each effect of “Prankids Prank” once per turn. A Quick-Play Spell That Lets You Fusion Summon Even During The Opponent’s Turn!! It’s Quite Strong Since Your Fusion Monsters Have Effects That Can Be Used Even During The Opponent’s Turn!! During the Main Phase: Fusion Summon 1 “Prankids” Fusion Monster from your Extra Deck, using monsters from your hand or field as Fusion Material, also for the rest of this turn after this card resolves, you cannot Normal or Special Summon monsters, except “Prankids” monsters. A Continuous Trap That Lets You Link Summon Even During The Opponent’s Turn!! It Also Restrains The Opponent With An Effect To Lower The Opponent’s ATK! During the Main Phase, you can: Immediately after this effect resolves, Link Summon 1 “Prankids” Link Monster using “Prankids” monster(s) you control as material. When an opponent’s monster declares an attack: You can banish this card from your GY; shuffle any number of “Prankids” cards from your GY into the Deck, and if you do, the attacking monster loses 100 ATK for each card returned, until the end of this turn. You can only use each effect of “Operation Prankids” once per turn. Let’s Go To The Experience Event! You can choose to experience either the “Prankids” or “Mayakashi” Decks! Participation is free, and before Dueling those participating will get a lecture on how to play the Deck from the staff! ▼ An Experence Event where you can Duel with Decks containing the latest cards before they’re released! What Kind Of Cards Will You Combine For Your Deck? Consider good cards that can work together! ─── By specifying conditions to search the Card Database, you’ll discover new possibilities! The third Deck Build Pack appears that lets you enjoy building a Deck with just the cards included, thanks to containing cards of the same theme! This time it contains cards from three series of different types, It also includes highly versatile cards that can be used into all sorts of Decks! The first theme is “Nephthys” that has new cards appear for it, allowing it to return as an incredibly powerful series! Also, keep your eyes on the “Prankids” and “Mayakashi” series that make their debuts here! !